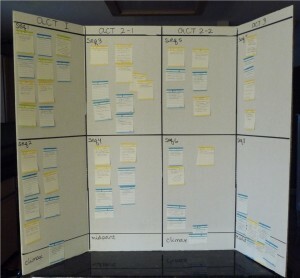 Here's an example of index cards on a tri-fold board. But you don't have to be that neat! 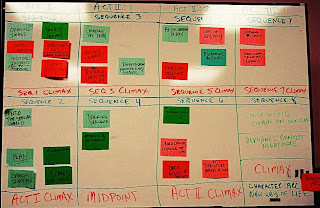 Here is a photo of the grid on a white board - with sticky Post Its as index cards. A wall will also work just fine. 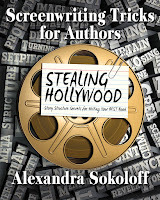 All the information on this blog and much more more, including full story structure breakdowns of various movies, is available in my Screenwriting Tricks for Authors workbooks. 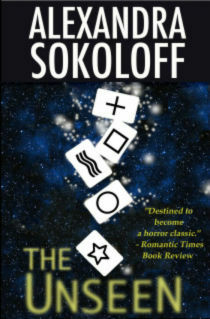 E format, just $3.99 and $2.99; print 14.99. What a practical organizational structure! Thanks. I'm really loving these posts. Thanks so much for doing them. Alex, I love the expertise and detail you share with all the items on your blog. I refer to them all the time. Thank you for your generosity. I should have said it a long time ago. Love Love Love this. After the week in West Texas I can't imagine writing another story without it. I found some mini-tri folds that can travel with me! Thanks so much for sharing. Lily, thank you, it means a lot to hear it. Jolene, you have an exceptionally good board. I should find the photo I took of it! you indicate that there is an option to buy via PDF but I cannot find it. Amazons answer to me was buy a kindle. Can you tell me how to get the PDF? You indicate that there is a PDF version available, but I cannot find that option. can you tell me how get the none-kindel version? 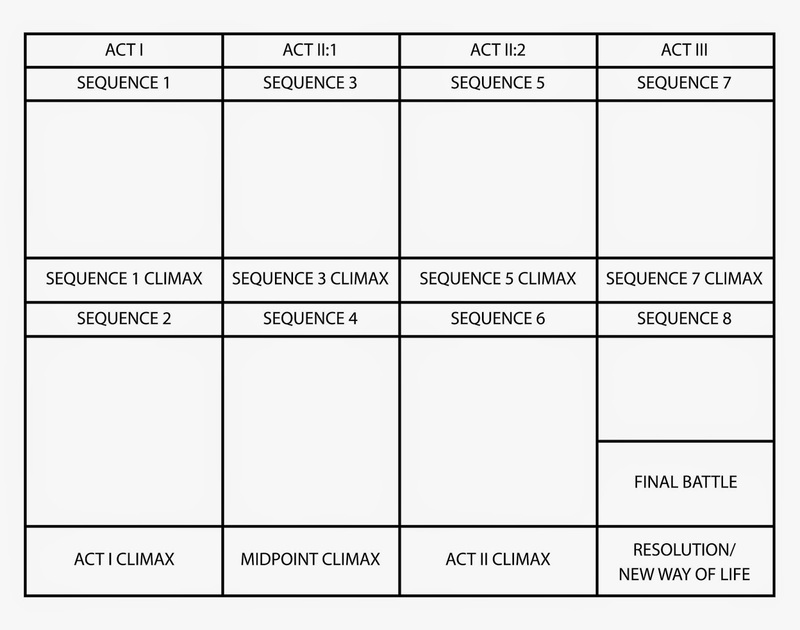 There is a program called Scrivner that contains all you need for doing these preliminary steps as well as writing. Learning curve is kinda steep, but the intro tutorial does help. I'm going to try to use it this year for NaNo. The well, after all these years, is a bit low. Hi Anon. Yes, I understand that there are software programs that simulate the index card method. That's fine. But I very strongly encourage you to try this physical method in addition to brainstorming on the computer. 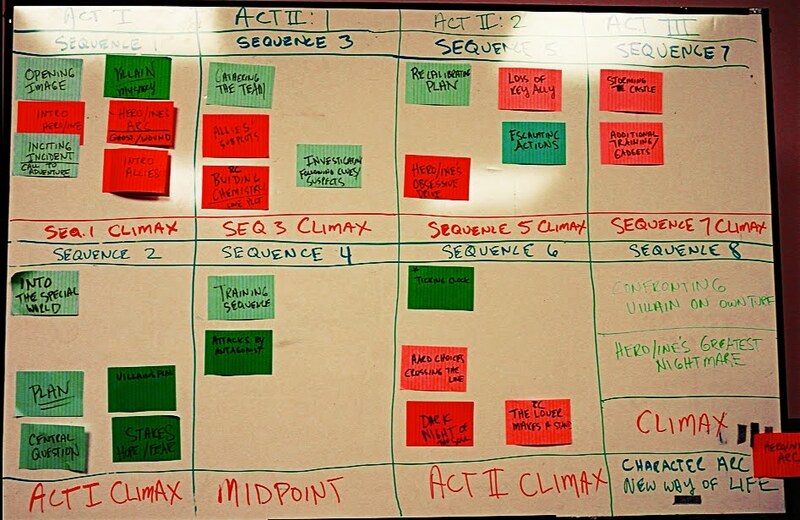 Working with actual cards or Post-its is >kinetic learning<. It activates different parts of your brain and creative processes than typing does. Brainstorming with a software program is not the same as using your body as you work. Thank you so much for this - I have been so stymied with the complexity of the story I want to write and how to structure it, not knowing which way to turn. I'm pretty left brained, so this really appeals to me. Now I have the tools to pick up my novel again...full of gratitude! Susanne, I'm thrilled that the method helped you through your block! We all have to go back and forth between those right-brained thunderstorms of creativity and left-brained organizational thinking.